George Marinko was the son of a Waterbury, Connecticut brass worker. From 1925, until 1929, Marinko studied at the Waterbury Art School with Louis York, a faculty member of the Yale School of the Fine Arts. Marinko clearly impressed his teacher. In 1929, local money was found to send Marinko to New Haven for further study at Yale. He spent a year there, studying with York and Eugene Savage before the fall out of the stock market crash forced a return to Waterbury. At home, Marinko made a living as best he could. By the mid-1930s, he arrived at surrealism as his personal style. The path that led George Marinko from a Roman Catholic first-generation immigrant working-class upbringing to surrealism is not at all clear. It is a curious fact that, in the early 1930s, Connecticut was the primary location for the introduction of this European avant-garde style to the United States. In 1927, Arthur Everett “Chick” Austin Jr. became director of the revered Hartford institution, the Wadsworth Atheneum. In his eighteen years as director, Austin undertook as his mission the introduction of avant-garde, modernist styles in fine art, music, drama, and dance to the United States. To that end, in 1931, the Wadsworth Atheneum presented the first show of Surrealism in America, Newer Super-Realism, featuring the work of Salvadore Dalí, Giorgio De Chirico, and Joan Miró, among others. Austin also encouraged the turn toward surrealism by the Hartford artist James Guy and his friend and fellow artist, Walter Quirt. By 1932, Guy had left Hartford for New York where he and Quirt produced surrealist art suffused with the ideals of the political left. There is no direct link between Marinko and Guy, nor ever any obvious political agenda for Marinko’s work. Waterbury is about 25 miles west of Hartford. The Wadsworth Atheneum show was widely reviewed, and Austin’s support of avant-garde cultural forms was continual and unwavering. While no evidence links George Marinko with Austin or Guy, it is impossible to believe that the Waterbury artist was not impacted by the events in Hartford. Through the 1930’s Marinko worked to establish his professional career. In 1934, supported by the Connecticut Civil Works Administration, he joined with artist Francis Jmanie to paint a mural for the aldermanic chambers in Waterbury City Hall, which remains in place today. In 1934–35, he made a trip to Europe, traveling on a merchant vessel. In 1937, he went to Mexico, and, in 1938, back to Europe. In 1936, Marinko received important recognition of his surrealist bona fides when Alfred Barr included a small oil painting, Inevitable Recollection, in his historic exhibition at the Museum of Modern Art, Fantastic Art, Dada, and Surrealism. At the end of the decade, Marinko married a fellow painter, Elizabeth Roberts. In 1938, he was represented at the Whitney Museum of American Art’s “Annual Exhibition of Contemporary Painting” with Christmas Night. In 1939, his Orpheus and Agony was exhibited at the World’s Fair held in Flushing Meadow, New York. The early 1940s saw a flurry of activity. Marinko sent paintings with titles that suggest surrealist imagery to the Whitney and the Art Institute of Chicago in 1941 and 1942; to the Corcoran Gallery of Art in Washington, D.C. in 1941; and The Pennsylvania Academy of the Fine Arts, Philadelphia, in 1941 and 1944. Tellingly, the 1941 contribution had a title suggesting the regionalist landscape style that would become Marinko’s bread and butter: New England Winter. 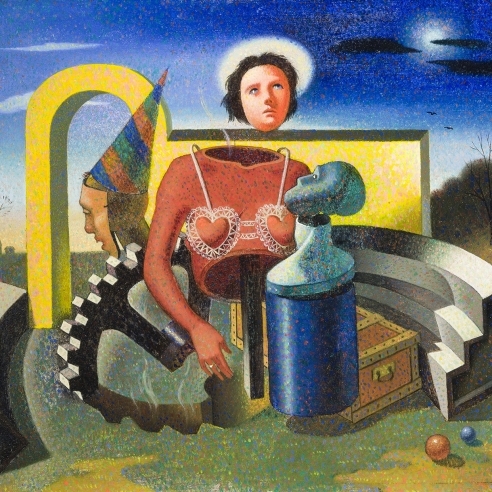 George Marinko did not return to surrealism after the War. In 1946, his son was born. From 1945 until 1947, Marinko taught at the Waterbury Art School. He also worked as a director at the Hudson River Museum in Yonkers, New York, in the early 1950s. In the postwar period he produced a series of wood sculptures and a varied oeuvre of paintings including regionalist landscapes and works in styles that can be generally described as precisionist, and cubist as well as abstract. He painted still lifes in a mainstream modernist style. Marinko was particularly fond of clowns as a subject. In addition to his wood sculptures, he executed a series of masks in mixed media. Marinko remained firmly based in Connecticut where his work, though was appreciated by local collectors and museums, did not attract a wider audience. He continued to paint until he died in New Haven in 1989.